The Carnegie Institution for Science and the International Astronomical Union’s Minor Planet Center has announced the discovery of dwarf planet 2015, the world with an extremely distant aphelion (farthest point in orbit) from the Sun, an object approximately 300 kilometers (186 miles) in diameter. 2015 TG387 takes 40,000 years to orbit the Sun and has a highly elongated orbit that takes it no closer than 65 astronomical units (AU) to the Sun, and the same orbit takes 2015 TG387 as far out as 2300 AU (or 213.8 billion miles) from the Sun. For comparison, Earth orbits 1 AU (93 million miles) from the Sun, and Pluto is currently at 38 AU from the Sun. 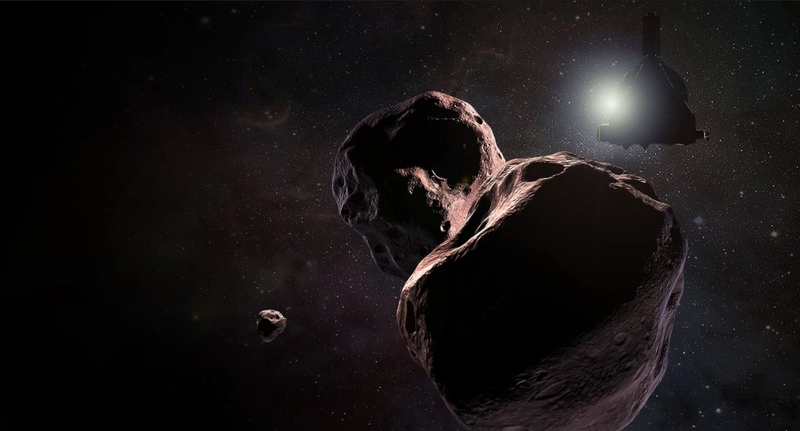 Ultima Thule, the Kuiper Belt Object that the New Horizons spacecraft will fly past on January 1, 2019, is 43 AU from the Sun now. The object with the farthest aphelion from the Sun, 2014 FE72, orbits from 36 AU at perihelion (closest point in orbit) up to approximately 3000 AU from the Sun. 2015 TG387, also known as “The Goblin” for its month of discovery and TG designation, was first sighted in October 2015 by a team engaged in an ongoing effort to search for dwarf planets and Planet X. This team, led by Scott Sheppard from Carnegie, Chad Trujillo from Northern Arizona University, and David Tholen from the University of Hawaii, first detected 2015 TG387 at a distance of 80 AU from the Sun using the Subaru 8-meter (26 foot) telescope at Mauna Kea, Hawaii. After initial sighting, follow-up observations of the object, shining at a dim 24th magnitude, were made from 2015-2018 at telescopes at the Las Campanas Observatory, Chile and the Discovery Channel Telescope in Happy Jack, Arizona in order to precisely measure the object’s orbit. 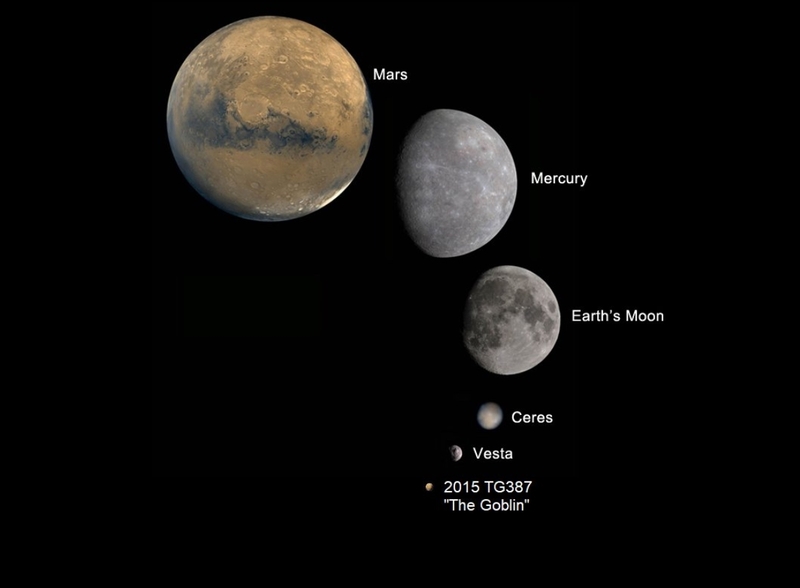 2015 TG387’s orbit is observed to be similar to other dwarf planets such as Sedna and 2012 VP113, which also are extremely elliptical. 2012 VP113 was discovered by Dr. Sheppard’s team and has a perihelion of 80 AU and an aphelion of 438 AU, while Sedna has a perihelion of 76 AU and an aphelion of 936 AU. All three of these worlds are considered “low bias” as they were discovered by uniform surveys of the northern and southern skies rather than through targeted surveys covering a particular region of sky, and these worlds have elongated parts of their orbits clustering in the same part of the sky (a similar longitude of perihelion). This can be an indicator of a larger object further out, such as “Planet 9/Planet X” shepherding these bodies, though the discovery paper cautions that more discoveries of “low bias” objects are needed to confirm that this clustering is not random. Dr. Sheppard’s team ran computer simulations showing that 2015 TG387’s orbit was stable throughout the life of the solar system and that there was shepherding by the unseen object similar to that found in other bodies. The team believes that this strengthens the case for the hypothesized “Planet X”, and Dr. Sheppard believes there is an 85% chance that “Planet X”, a “super-Earth” world believed to be approximately 10 earth masses orbiting between 200-700 AU from the Sun, is real. As for 2015 TG387 itself, its estimated size of 300 kilometers is based on assuming a moderate albedo (reflectivity of light) and although it’s believed to be spherical we don’t even know what color it is yet, and no spectroscopy has yet been taken, so there’s further opportunity for study of “The Goblin” while it is near its perihelion to the Sun. Once “The Goblin” goes much further out it will be impossible to see with present-day technology, and this limitation would also apply to most of the 2 million objects over 40 kilometers (25 miles) believed to be in that part of the sky, called the Inner Oort Cloud. “The Goblin” is a very appropriate nickname for 2015 TG387, as it makes its home in a dark, remote part of the Solar System, though a formal name may be chosen for it at a later date. It is very fortunate that objects like “The Goblin” are close enough now to discover them. Studying objects like “The Goblin”, which do not get close enough to interact with the large known planets of the Solar System, will help us to better understand what happens on the fringes of our Solar System.